We have been exhibiting our West Highland White Terriers since 1999. What started off as a hobby has very quickly become a lifestyle! 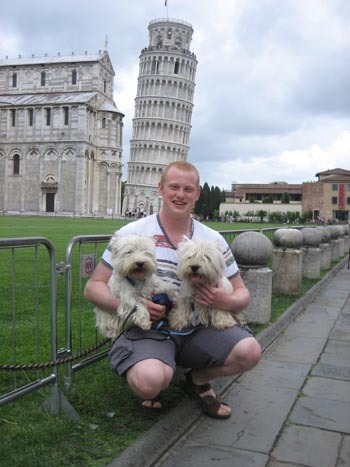 It all started when we purchased a West Highland White after we had lost our Cairn Terrier. 'Loafa' died young of heart failure and we decided that in time we would purchase a 'Westie', in 1995 we bought 'Rona'. The idea of showing was non existent at that point, she would be our loving pet. As time went by, everytime Rona came in season a black Labrador appeared in our drive. It was decided that we would have one litter of puppies from Rona before we had her spayed. After mating 'Bertha' to (CH)Lindenka Brannigan, she produced Tomlyndon Tristana (Bessey). We had enjoyable times with Bessey and we began to be positioned with her at most shows. She qualified in the breed for Crufts with a 1st place as a Minor Puppy at the City of Birmingham show in 2001. We campaigned Bessey for five years during which she qualified for Crufts three times and was the winner of five YKC Stakes classes. In 2005 we were contacted by Barbara Graham of the famous Lasara Kennels. Due to her ill health and as she thought kindly of Thomas she offered us Lasara Libra (Libby) who at that point was aged 14 months. Libby had been handled up to that point in the breed and had very good placings. We were delighted to receive Libby and we set out during the first winter months to try and obtain her Junior Warrant. Both ourselves, and Barbara, were delighted she was able to acheive this. Libby is the dam to our first Champion, CH & INT CH Tomlyndon Look Of Love. Since Blanche's title, both Alfred (CH & INT CH Karamynd Playing Away At Tomlyndon JW) and more recently Blanche's son CH Tomlyndon Spoilt Rotten have become Champions. We have exhibited across Europe at shows in Sweden, Denmark, Germany, Switzerland, France, Italy, Belgium and Holland. We were delighted when Blanche & Alfred completed their International Titles. Thomas is on the A3 list for Judging the Breed and has had the honour of judging at Club Open Shows in the UK as well as the WHWT Club of Finland Championship Show (August 2012) as well as the National Elevage in France (October 2012). Fredaricka is the Honorary Secretary of The West Highland White Terrier Club of England.